A 2007 report from the Tennessee Department of Safety and Homeland Security cited 113 bus crash fatalities in Knox County and ranked the area the seventh most deadly county in Tennessee for accidents involving buses and large trucks. With the amount of passengers a bus can carry, the drivers responsibility to keep their riders safe increases greatly, though bus accidents can be some of the most serious on Tennessee's roads and highways. Because a bus has a high center of gravity they are prone to tipping and rollover accidents and these incidents can leave passengers with a number of severely debilitating injuries, or death. If you were injured in a bus accident, or if someone you love died because of another persons negligent actions you may be eligible for compensation based on the pain and suffering you experienced. 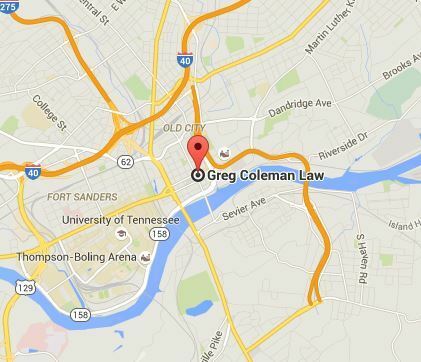 At Greg Coleman Law, our team of Tennessee bus accident lawyers believes that the victims of negligence deserve to be represented competently and compassionately in court. We always fight for the MAXIMUM amount of compensation due to the victims of bus accidents, and our attorneys have years of experience with auto, truck and bus accident litigation. To find out how we can help, simply fill out the Free Case Review form located at the top of this page, on the right. The review is always 100% FREE and there is never any obligation to proceed. In addition, your information will always remain completely confidential. A bus is classified as a passenger vehicle with the capacity to carry more than 10 people at a time, carrying two axles and six tires or three or more axles. As such, these vehicles can weigh well over 10,000 pounds and in many cases do not have safety devices like seatbelts to protect their passengers. Because of this, injuries in bus crashes oftentimes involve passenger ejection or even driver ejection. Buses are usually commercial, however they can be converted and people sometimes use them for personal travel or long trips. When sharing the road with a bus always remember to drive defensively and avoid their blind spots. Never assume the bus sees your vehicle, and for pedestrians it is especially important to be aware that the drive may have difficulty spotting you. Though each situation may vary, bus drivers and other motorists commonly perform a number of negligent behaviors that will lead to a crash. By their nature accidents are avoidable occurrences, compounded by a number of factors that usually involve some form of driver negligence. Factors such as speeding, an intoxicated driver or a malfunctioning vehicle can worsen even the slightest accident. Speeding, as an example, will increase the force of a crash and cause more damage to the vehicles involved and, ultimately, the passengers inside. Pedestrians are at very serious risk of injury from buses, and the National Highway Traffic Safety Administration reports that school bus accidents will kill approximately 13 pedestrians and 11 schoolchildren every year. In 2009, the U.S. Department of Transportation reported over 20,000 injuries caused by bus accidents and 254 deaths nationwide. The harm that is done during an accident can be enough to permanently alter or end a life, as the statistics express. After an accident it is vital to seek medical attention immediately, even if it does not appear that you have been injured. The symptoms of internal organ damage can sometimes take up to a week to manifest, and a physician will be able to diagnose any suspicious signs before they become an issue. If you are the victim of serious personal injury or wrongful death from a bus crash in Tennessee, contact a lawyer and explore the rights you have to file a claim against the negligent party. The compensation that is awarded following a successful verdict or settlement can help pay medical bills, rehabilitative fees and other costs incurred from the accident. At Greg Coleman Law we are well versed in truck collision litigation, and we know firsthand that accidents involving buses and motor vehicles can result in some of the most catastrophic injuries. Our attorneys have extensive experience in this area, and with our main office in Knoxville, we are licensed to serve the entire state of Tennessee. To learn more about how our attorneys are able to help in your time of need, or to schedule a free no-obligation consultation, we welcome you to contact us today at (865) 247-0080 and a member of our intake team will obtain the details of your collision and refer you to one of our experienced bus accident attorneys. Start now, fill out the Free Case Review form on this page Its That Easy!